With the festive season round the corner, domestic sales of passenger vehicles — cars, utility vehicles and vans — surged 14 per cent in August as dealers built inventory. 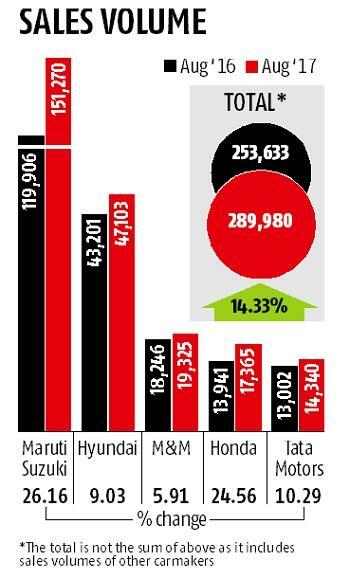 The industry is estimated to have sold almost 290,000 vehicles last month, with double-digit growth from market leader Maruti Suzuki, besides Honda and Tata Motors. Hyundai, the second-biggest player, saw volume grow at nine per cent. July sales had grown 15 per cent. Maruti, which now commands a 50 per cent share in the domestic market, sold 151,270 units to dealers last month, against 119,906 units in August last year. Sales of compact segment vehicles (Swift, Baleno, etc) rose 62.4 per cent to 74,012 units, while utility vehicle (Brezza, Ertiga, etc) clocked growth of 27.6 per cent. The mini (Alto, WagonR) segment, however, remained flat at 35,428 vehicles. The company’s stock price gained 1.43 per cent to close at Rs 7,812 on the BSE on Friday. Korean carmaker Hyundai said its sales grew nine per cent in August to 47,103 vehicles. Rakesh Srivastava, director (sales and marketing), said the company managed to grow sales volume in a “market fuelled with speculation” on the GST (goods and services tax) cess increase and challenges posed by floods in many states. “We foresee strong buying in festive period, due to the spread of monsoon and our product portfolio”. Navratri, an auspicious occasion for purchases of consumer durables, cars and real estate, begins on September 21 and ends on September 29. Sport utility vehicle major Mahindra and Mahindra (M&M), the third-biggest player, has reported sales growth of six per cent in August. “Our brands continue to gain traction despite several external challenges. As we get into the festive season, we are confident of good growth over the next couple of months,” said Rajan Wadhera, president (automotive sector), M&M.Another home-grown automobile major Tata Motors has seen a 10 per cent jump in August sales volume to 14,340 units. “With Ganesh Chaturthi, we have entered the festive season and we expect the growth momentum to continue,” said Mayank Pareek, president of the passenger vehicles business unit at Tata Motors. He attributed the growth to new products like Hexa, Tigor and Tiago. The company’s stock gained 3.74 per cent to close at Rs 390.7 on Friday. Japanese car maker Honda saw a 24 per cent increase in sales volume to 17,365 units. Its Japanese peer Toyota has reported a six per cent drop in August volume to 12,017 vehicles. N Raja, director and senior vice-president (sales and marketing) at Toyota, said the sales numbers of August are not truly reflective of the existing customer orders. “After the announcement on potential cess hike, there was a considerable rise in customer enquiries and orders. We had production limitations that held us back from catching up with the high demand,” he said. Volumes at French car maker Renault continue to decline and the firm is said to have seen its sales shrink by 26 per cent in August. Players like Ford, Nissan and Volkswagen also saw a dip in sales.